TMTG proudly presents Calamity Jane, which will be performed in October 2015 under the direction of Alison Hennessey. A wonderful score that includes The Black Hills of Dakota, The Deadwood Stage (Whip-Crack-Away), Windy City and the Award winning song Secret Love, don’t miss this new production! Deadwood City’s most famous peace officers Calamity Jane and Wild Bill Hickock, get involved in saving the neck of Henry Miller, the local saloon operator. It seems that ‘Millie’ has been promoting a beautiful actress named Frances Fryer, but Frances turns out to be a boy – Francis. Millie’s attempt to cover up is soon unmasked by the angry miners and to keep the peace, Calamity sets out for Chicago to bring back the miner’s real heart-throb, Adelaide Adams. In Chicago, Calamity mistakes Adelaide’s maid, Katie Brown and hauls her back to Deadwood. Katie is greeted warmly, but breaks down and confesses that she is not the famous star. Calamity once more has to restore order and persuades the audience to give Katie a chance, they do and she wins the heart of every male in town, including Calamity’s dashing love hope, Lt Danny Gilmartin. Calamity reluctantly overcomes her jealousy over losing Danny and discovers her true love for Wild Bill. 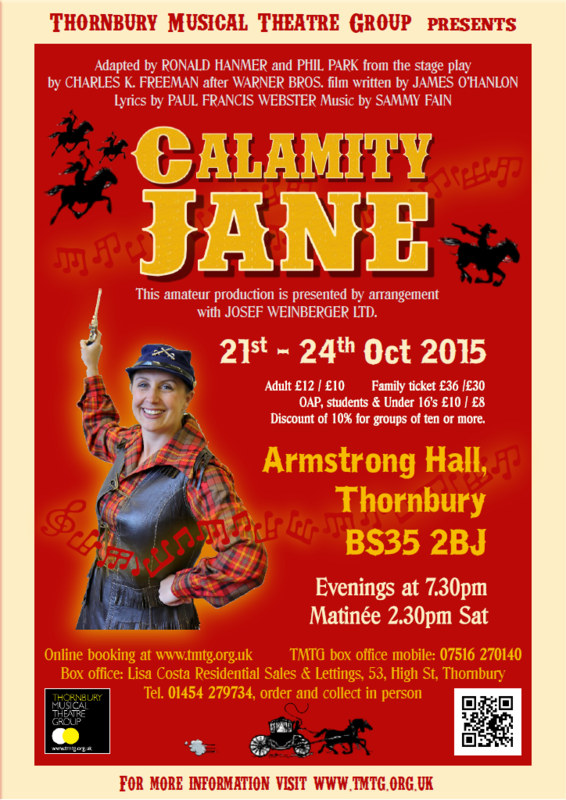 It's now less that ONE WEEK to Calamity Jane! The set is being moved into the Armstrong Hall tonight and the next rehearsal is the dress rehearsal! The last in our series of video diaries features an interview with our director Ali Hennessey, explaining what she loves about the show, as well as the cast's first rehearsal at the Armstrong Hall . If you haven't got your tickets yet then HURRY as seats are going fast! In exactly two months time it will be the final performance of our latest production Calamity Jane! Rehearsals are well underway, so get a sneak peak of what you can expect to see on the night with the second in our series of Calamity Jane Video Diaries, featuring our very own Katie Brown and Lieutenant Danny Gilmartin (played by Olivia Mills & James Barnes). Thornbury Musical Theatre group are delighted to announce that tickets are now available online for its latest production "Calamity Jane". To celebrate the launch of online tickets, the group has released the first of a series of video diaries, giving you a preview of what you can expect to see on stage. To all members and non members - auditions for main characters in Calamity Jane are being held at Tytherington Village Hall this Sunday 21st June from 4pm. Characters include Calamity Jane, Katie Brown, Miller, Bill Hickock among many more. TMTG always welcome new members, so please do come along and join us for this "whip crackin'" show! Very entertaining. An excellent evening out at reasonable cost and free parking. Why bother to go into town with this on our doorstep. Words fail me - and as those who know me well that very rarely happens. I really had to pinch myself and look at the programme again to believe that this was going to be an amateur production. From the outset the cast was bang on form. The principals singing and stagecraft was on a par with many professional theatre and I have seen dozens of those productions. I cannot understand why we have never been to see the Thornbury players before. Thank you for a fantastic evening - we shall return again and again! Very professional performance, we thoroughly enjoyed our first visit to Armstrong Hall. Looking forward to the next production.